Sorry, Contest is over! Thanks for everyone who participated! Winners will be announced on the afternoon of 06/22/09! ManBabies.com is Proud to announce it’s first Give Away Contest in celebration of Father’s Day and our brand new T-Shirts! 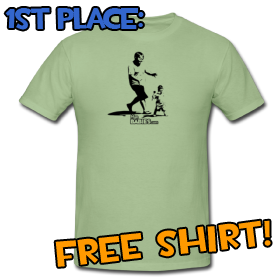 1st Place Prize: Check out these sweet threads. You will be the epitome of coolness, the envy of all your friends, with this bad boy. Shirts come in Men, Women, and Child’s sizes! 2nd Place Prize: A personalized ManBaby. You send us any picture, and we’ll make a ManBaby out of it! It’s really simple. If you have a twitter account, send a tweet to @manbabies (http://twitter.com/manbabies). It doesn’t matter what your message is, it can be a question, suggestion, or just a shout out telling us what you think. Once you have done that, come back here and leave a comment with a link to your twitter account, and you are entered into the contest! For those without a twitter account, your are still in luck. You can leave a comment here like the one we are asking for above, although you will only be eligible to win the 2nd place price. Make sure that you include your email address so we can contact you if you win! We are running the contest until Father’s Day, so you have until 11:59 PM CDT on Sunday June 21st to enter! Winners will be announced in the afternoon on June 22nd and will be contacted by email or twitter. Need a gift for father’s day? How about giving him the joy of a ManBabies t-shirt? This is great. I’m not sure why. Oh man. Manbabies. I loooooove Manbabies. They subvert the minds of paedophiles. Helllllloooooooo man babies i want i want i really want the t-shirt!!!! Oh you want a message here too? Here we go, I’m getting into the mix! Cool! you have been duly tweeted and commented on by $InfiniteLoop. Absolutely ridiculous, yet somehow very sweet… love it! Happy Fathers Day to manbabies everywhere! Thanks for letting me know that I have already won both 1st and 2nd place. My Twitter Account Link. I was looking evhyewrere and this popped up like nothing!